Big sedans like the Town Car and its main rival, the Cadillac Fleetwood, are plush, quiet, and comfortable. However, newer luxury models are now available that offer comparable luxury, more agility, and better overall economy. The venerable four-door Lincoln sedan, the best-selling model from Ford’s luxury division, received its first major redesign since it was introduced in 1980 under the Town Car label. The V8 engine and rear-drive platform of the original Town Car were retained, but the previous generation’s square body gave way to rounded corners and an aerodynamic look. 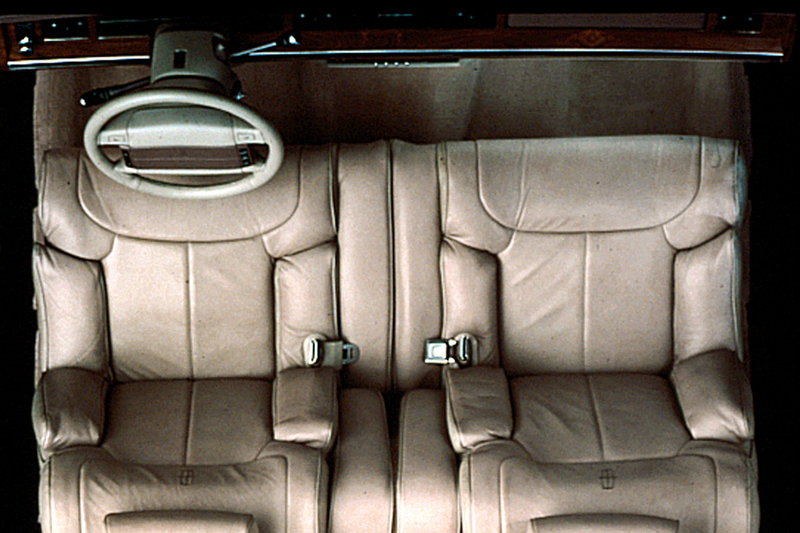 The model range for 1990 started out with a base unit, a midlevel Signature Series, and a premium-level Cartier Designer Series. The 4.6-liter aluminum-block V8 replaces the 5.0-liter V8 from last year and the new traction-control system, which Lincoln calls Traction Assist, becomes available for cars equipped with antilock brakes. The Town Car also gets a new front suspension design and 4-wheel disc brakes in place of the front-disc/rear-drum setup previously used. Now in its third year, the Town Car gets few changes. With optional dual exhausts, the V8 has an output of 210 horsepower. The no-name “base” version is now called the “Executive Series” model. 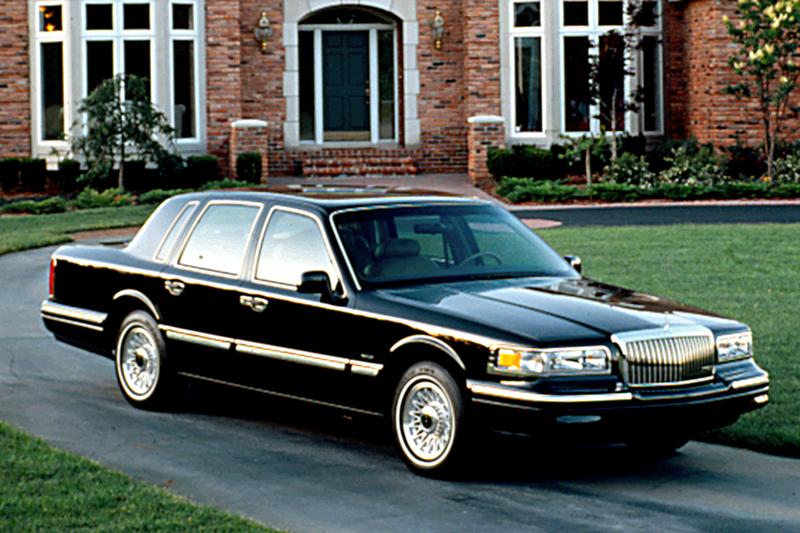 1993 Town Car. A remote keyless entry system is now standard, as are dual airbags. Dropped for this year is the Insta-Clear heated windshield. 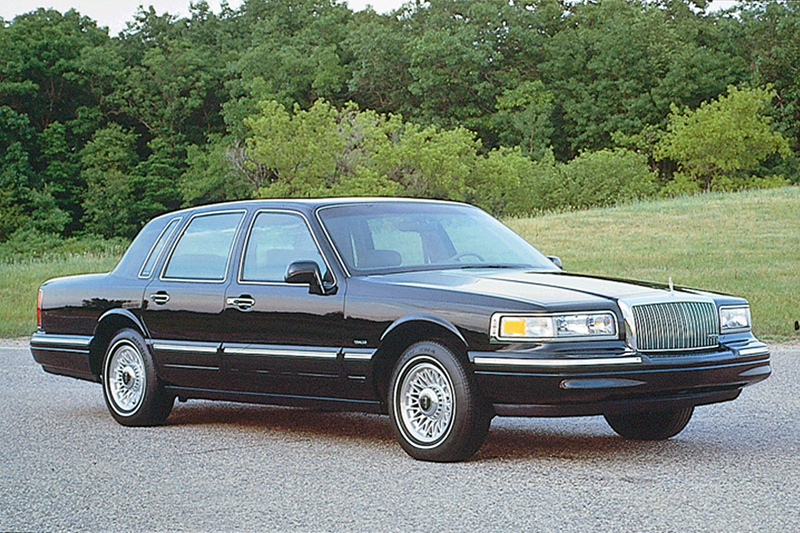 Previously optional dual exhausts are now standard on the 1994 Town Car. As a result, all three models now provide drivers with 210 horsepower and 270 pound-feet of torque. To accommodate differing tastes in steering effort, a new dashboard-mounted switch, standard on Signature and Cartier models, electronically adjusts steering effort. Exterior changes include new headlamps, taillamps, grille, front and rear bumper fascias, color-keyed side moldings, and larger, color-keyed outside mirrors that are moved forward slightly to improve visibility. Inside, the Town Car provides new seats that provide extra travel, a redesigned instrument panel, and a new 2-spoke steering wheel. Lincoln celebrates its 75th anniversary in 1996 and marks the occasion with a Diamond Anniversary Edition of the Town Car. The anniversary edition comes in two color schemes: cordovan with a charcoal interior and silver with a red interior. Upgrades are also performed on the 4.6-liter V8, designed to make the Town Car’s engine smoother, quieter, and more efficient. 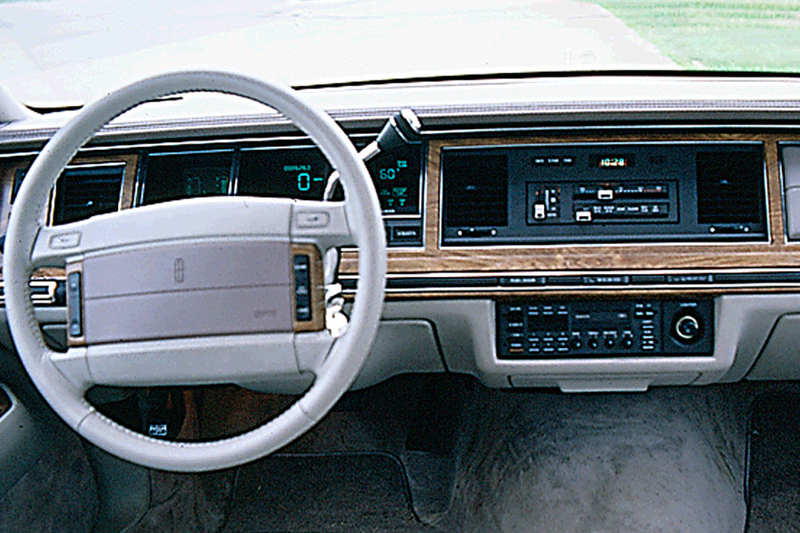 Finally, the Cartier Series gains real wood trim on the dashboard and around the window controls. The Town Car gains a revised power-steering system designed to provide more feel, but loses some standard features that help hold down prices, especially on the base Executive and Signature Series models. Both cars return for 1997 without a dual exhaust system, resulting in a loss of 20 horsepower. Power from the standard 4.6-liter V8 drops from 210 to 190. 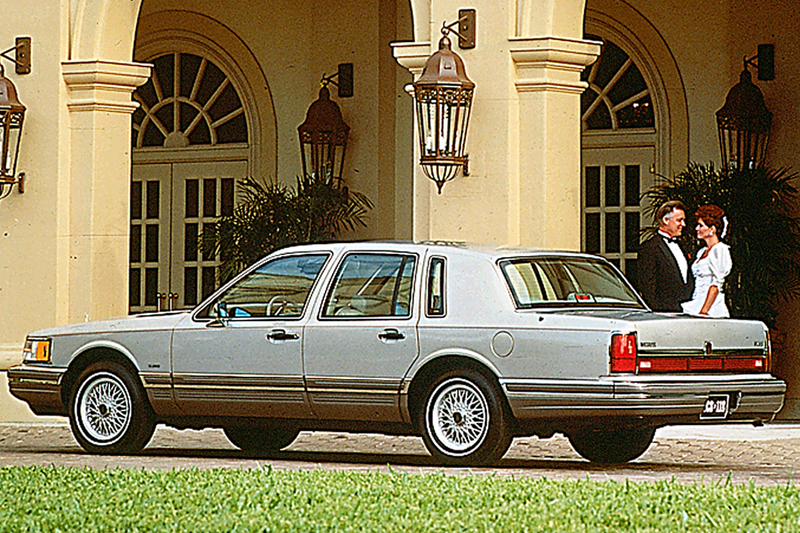 The current generation Lincoln Town Car arrived in 1990 with the iron-block, overhead valve 5.0-liter V8 that has powered Ford products for decades. But the Lincoln flagship quickly switched to an all-new OHC, 32-valve, 4.6-liter V8, the first overhead-cam V8 to be mass-produced by a domestic automaker. The new engine, mated with a 4-speed automatic overdrive transmission produces 190 horsepower at 4200 rpm and 260 pound-feet of torque at 3200 rpm. The optional dual exhaust system improved output to 210 horsepower at 4600 rpm and 270 pound-feet of torque at 3400 rpm. 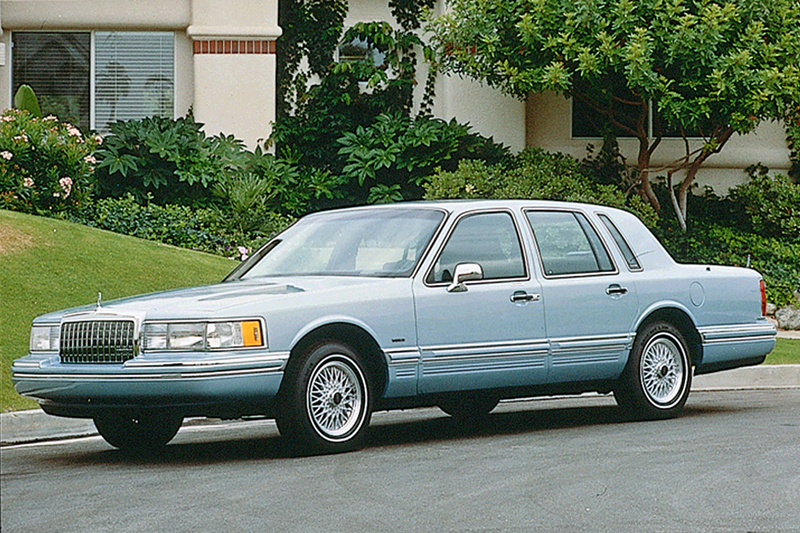 By 1994, the dual exhaust system is standard on all Town Car models. A new air-intake system for 1996 helps improve engine torque slightly, to 275 pound-feet at 3400 rpm. As a cost-saving measure the dual exhausts are dropped for the Executive and Signature Series in 1997, which lowers the horsepower back to 190, while torque scales back to 265 pound-feet. Despite its new V8 engine, the Town Car can hardly be classified as a sprinter, given the fact it tips scales at over two tons, but once underway, there’s strong acceleration and passing power. One drawback to brisk acceleration seems to be the 4-speed automatic, which is slow to downshift at times. As for economy, we’ve averaged an unimpressive 17 mpg in city/expressway driving. New suspension and further upgrades designed to improve the car’s handling arrive in the form of a Ride Control Package. The car retains much of its penchant for excessive body roll and the kind of pillowy ride characteristics preferred by domestic luxury-car buyers. If you’re not particular about handling, and need a spacious car, you’ve come to the right place. The Town Car is wide enough to accommodate six adults comfortably, while the large doors make entry and exit maneuvers effortless. For long trips, you can count on the spacious 22.3-cubic foot trunk to hold nearly all your worldly goods. Most controls are mounted high on the dashboard where they’re easy to see and reach while driving. Though the power window, door lock, and mirror controls are grouped on the driver’s door, they aren’t backlit at night. Huge rear roof pillars hinder the view while backing up. Description: Corrosion of hood-latch striker causes detachment, so hood can open unexpectedly. Description: Bearing within lower ball joint can weaken slowly during use and eventually crack; could result in separation, allowing control arm to drop to the ground. Description: Distorted fuel lines may contact steering-column universal joint and be damaged. Description: Secondary hood latch may not engage; if primary latch releases when car is moving, hood could fly up. Description: This vehicle was previously repaired using a wiring harness that is not compatible with the vehicle circuit polarity. Dealers will install a new wiring harness, or replace the mating electrical component. Description: Speed-control deactivation switch can develop short that could result in underhood fire, whether or not engine is running. Description: The speed control deactivation switch may, under certain conditions, leak internally and then overheat, smoke, or burn. This could result in an underhood fire. Dealers will install a fused wiring harness. Description: Brake-pedal pushrod retainer may be missing or improperly installed, which can cause disengagement and loss of braking. Description: Nuts and bolts that attach rear brake adapter to axle-housing flange can loosen and separate, allowing damage to ABS sensor, hydraulic line, and parking-brake cable. Description: Some passenger-side airbags may not inflate properly; also, igniter cap can separate, releasing hot gases. Description: Seal between fuel-filler pipe and tank may not be fully cured, which could allow fuel to leak. Description: Corrosion of inadequately lubricated Pitman arms can cause abnormal wear of joint, resulting in separation. Description: Passenger vehicles that have had the driver’s airbag module replaced after April 5, 2000, may have modules with inflators that lack insufficient welds and may prevent proper inflation of the airbag. Description: Driver’s door, when closed only to secondary latched position, may not sustain the specified 1000-pound transverse load. Description: Wrong parts may have been used to service seatbelts with switchable retractor for child restraints. Description: Replacement seatbelts made by TRW and sold by Ford may not restrain occupant in a collision. Description: Driver’s airbag module could stay in position during deployment, but leave the steering wheel cavity afterward.